If you have been looking to catch a mess of bluegill, I know just where to find them. Though they weren’t exactly what Roger Williams and I were looking for when we found their hiding spots. Like most summer fishing adventures on Lake Mohave, ours started early in the morning Saturday. Our path took us over the new Boulder City bypass known as Interstate 11 and south to Willow Beach. With the new freeway, our travel time was cut to little more than 30 minutes, about half the time it used to take from Henderson. The bypass is just that, so the last place you can buy gas and still take advantage of the shortcut is Railroad Pass. Willow Beach is a full-service marina located about 12 miles south of Hoover Dam on the Arizona side of the Colorado River. Well, technically it’s the upper end of Lake Mohave, but here the waterway is more like a river than a lake, so the Colorado River moniker still fits. You won’t find an old timer who calls it anything different. It was early enough that boaters still had their navigation lights on when Roger and I launched his boat and made our way south through lower Black Canyon. Here the water temperature remains a chilly 53 degrees or so despite the high summer temperatures common in the canyon. In sharp contrast to the cool river are the steep canyon walls that absorb the sun’s heat during the day and hold it through the night. Luckily, the movement of the boat across the water creates a rather pleasant cooling effect and gives anglers a respite from the heat. Our plan was to start the day with striped bass in the canyon and then move further south for largemouth and smallmouth bass. With that in mind, Roger shut the boat down where he reeled in a 15-pound striper with a low-slung belly a week earlier. For the next 45 minutes or so, we searched the river with trout imitations and other swimbaits. We were joined by other anglers who were fishing nearby, but despite our collective efforts the stripers proved reluctant. Roger’s bait may have been bumped once or twice, but he has been known to tell a fish story or two. It wasn’t long before our neighbors fired up their boats and disappeared down lake. We strapped our rods to the boat’s deck and followed suit. Well, we tried to follow suit, but when Roger turned the key, the boat motor turned over, and over, and over. It seems the old Evinrude was flooded and would need to sit for a while, so we unstrapped the fishing rods and went back to work. 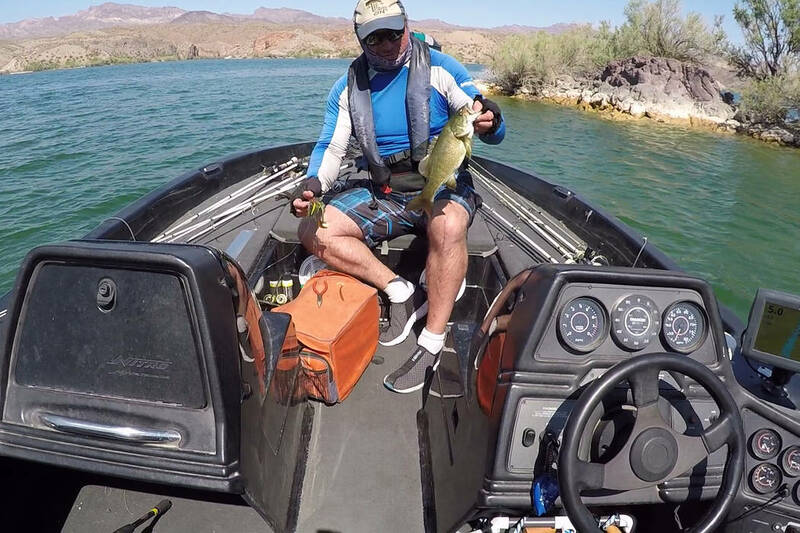 Another 45 minutes and no fish later, the boat fired up once again and we moved south to the place where Lake Mohave widens and the water temperature begins to warm. There we began searching the shoreline for both species of black bass. Roger started things out by reeling in a plump largemouth bass that weighed perhaps 2½-3 pounds. 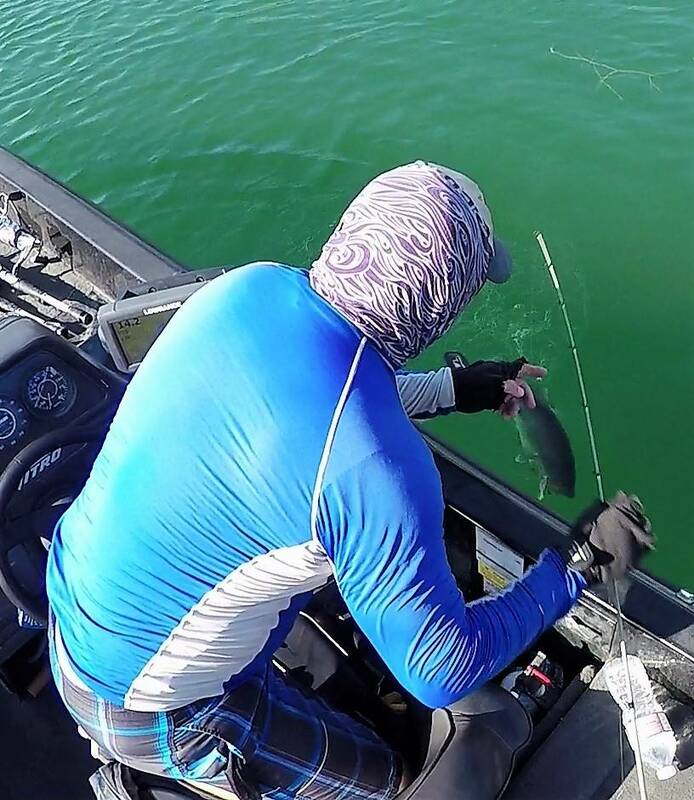 He caught the fish along a brush-choked shoreline with a shad-colored swimbait. As the day passed, we worked shorelines as well as coves, but the only thing we saw in the coves were bluegill and the odd catfish. 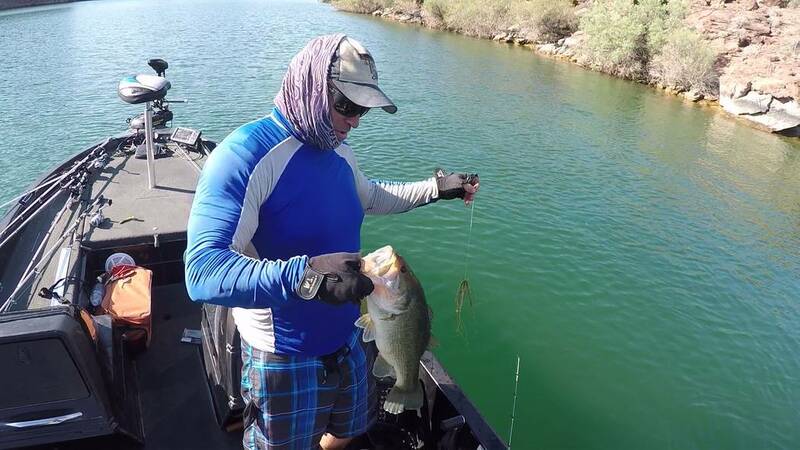 Any bass we caught came from points near the mouths of the coves or along the shoreline of the main lake where brush created cover over rocky shelves. Between us we caught perhaps 10 bass for the day. Most were largemouth but there were a couple of smallies in the mix. Roger caught most of his bass on a spinnerbait he customized to resemble a bluegill while mine were all fooled by a Keitech swimbait in electric blue and chartreuse fished on a dropshot. Though Roger out fished me on the bass, there came a time when I couldn’t keep the bluegill from taking my bait. Given the size of my swimbait and the dropshot hook, I was surprised they could, but neither one slowed them down. 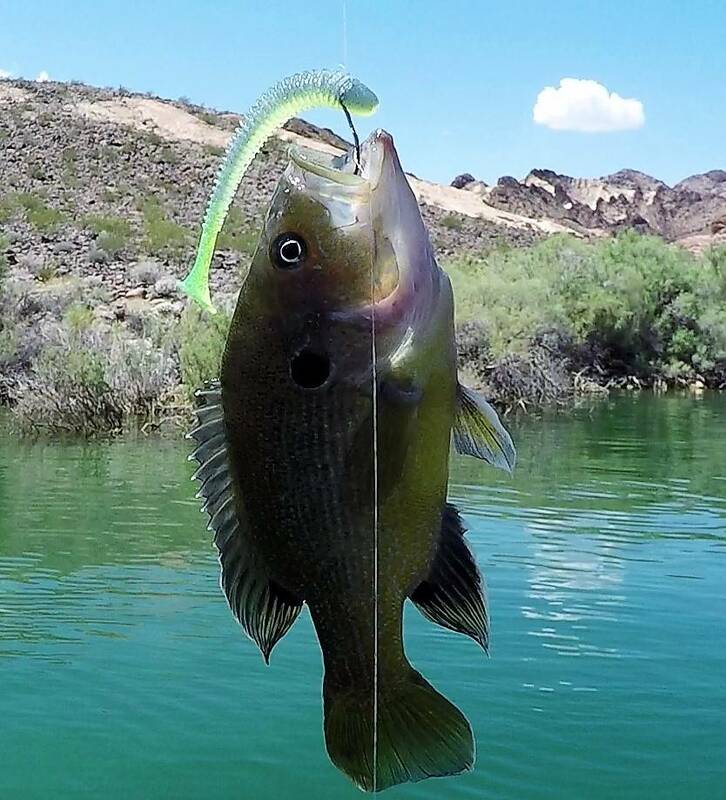 If you are looking for bluegill at Lake Mohave, think bass and throw them a swimbait on a dropshot. You won’t be skunked, and they’ll give you a pretty good fight. You might even catch a bass or two.